Motion sensor light switches are great for certain rooms – bathrooms, closets, basements and garages. In those rooms, I usually want the lights in the room to turn on when I enter. I also want the lights to turn off, even if I forget to turn the light switch off. Motion sensor light switches are great for bathrooms. With occupancy sensor light switches lights will come on when you enter the room and go off after you leave. These occupancy sensor dimmer light switches are not only convenient, but they save energy as well. Installation of motion sensing switches is relatively easy, is inexpensive and takes less than an hour to do. Read on for a simple, step-by-step of how to wire a motion sensor to an existing light. 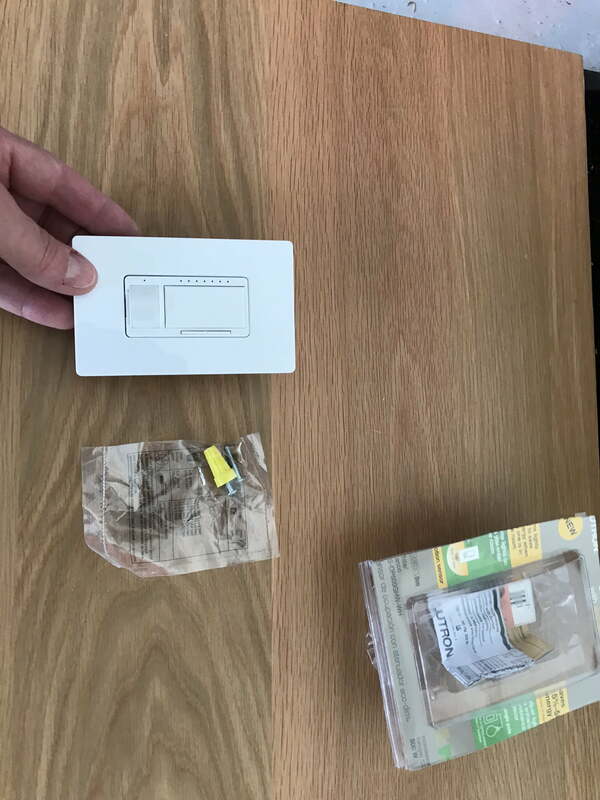 Smart light switch – motion sensor light switch install in garage. All switches have a rated power capacity – usually listed in Watts on the packaging. Watt ratings will be different for incandescent vs. CFL or LED lighting. 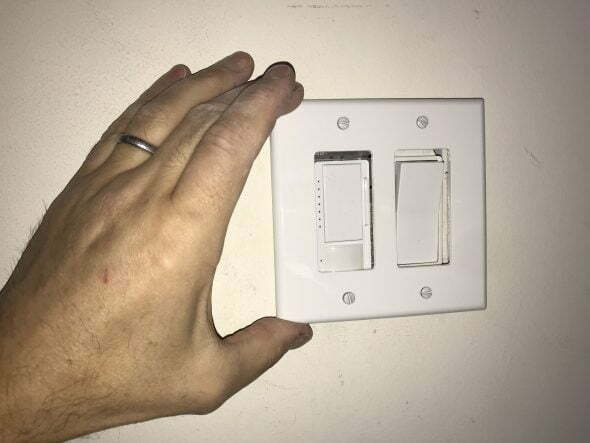 The switch I used is rated for 600 watts of incandescent lighting (example; six 100 watt incandescent light bulbs) or up to 150 watts of CFL or LED lighting. The power capacity of these switches may change if multiple switches are used together mounted adjacent in the same electrical box. 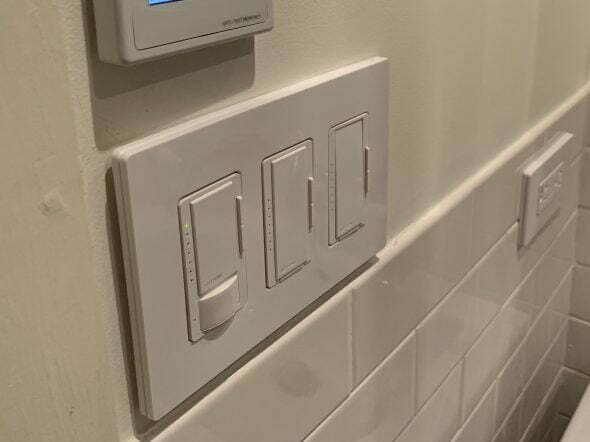 Lutron dimmer switches mounted together may require removal of aluminum head sink tabs that will reduce the cooling ability of the switch and decrease the power handling of such modified switches. The package insert for the dimmer switch contains a “Derating Chart” to use if the dimmer is modified. Remove switch plate and old switch. 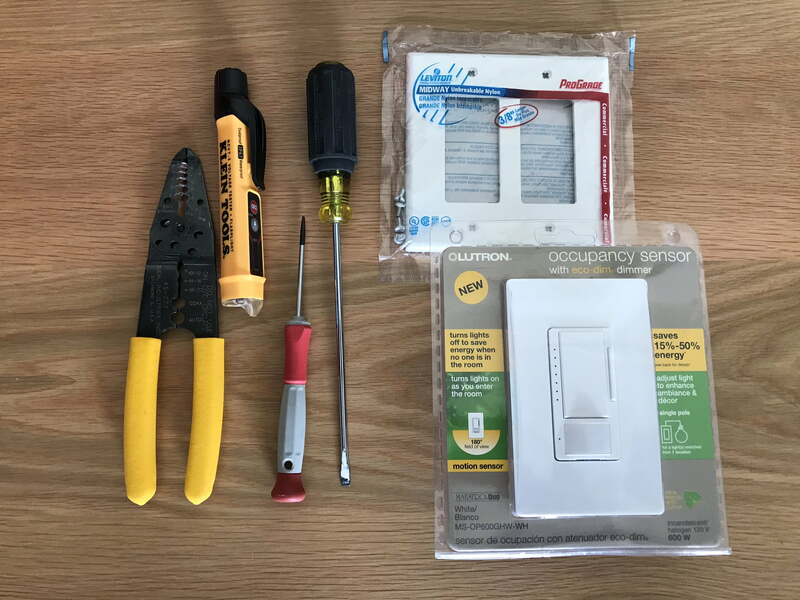 Assemble light switch and tools.Gather the tools you will need – typically a standard screw driver and a Philips screw driver, a wire stripper and a voltage tester. Wire cutter/stripper, screw drivers, a new switch cover and the Occupancy senor light switch. Turn Off Power!Locate circuit breaker supplying power to lighting circuit you are working on. TURN CIRCUIT OFF prior to any work on this circuit. Also turn off any power circuit with connections in the electrical box you will be working in. 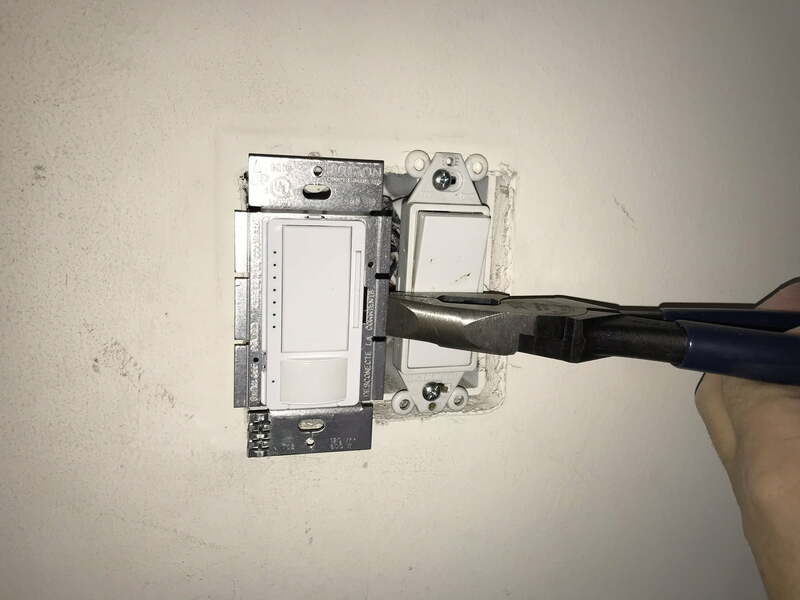 Remove Switch Plate.Remove switch plate from the light switch you would like to replace with the motion sensor switch. Most switch covers are fastened with top and bottom small standard slot machine screws. Remove screws to remove plate. 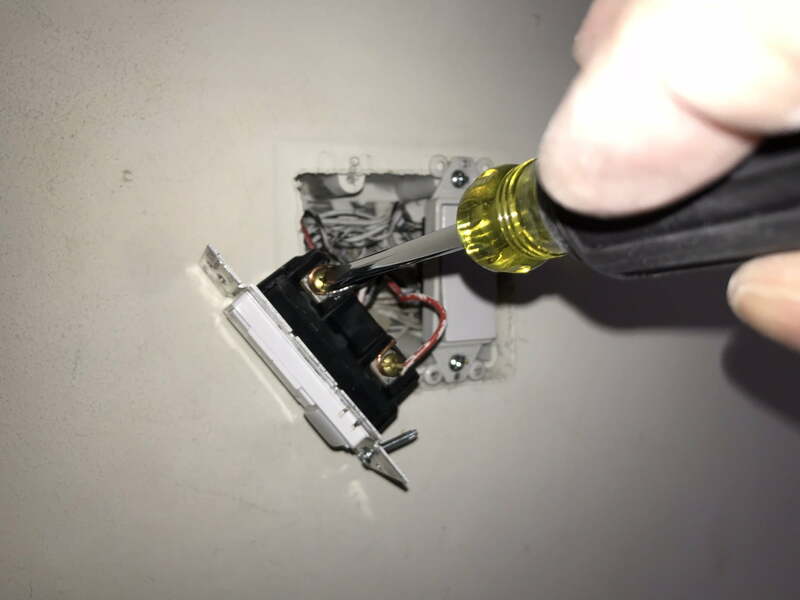 Remove switch cover using medium standard screw driver. 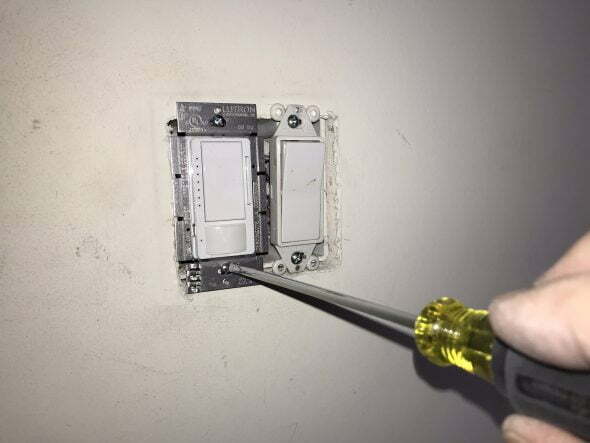 Some switch plates are screwless and are connected using locking tabs between the top finish plate and the mounting plate below. Use a standard screw driver to gently pry open the top plate by pushing locking tabs to unlock top finish plate. 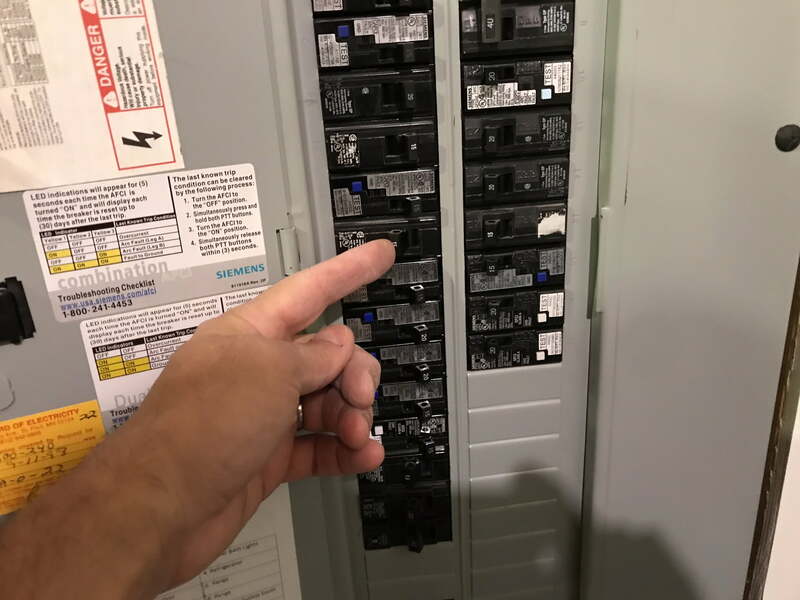 Check That Power is Off in the Box.Prior to doing any work in the electrical box, double check the power is off and that there are no live wires in the electrical box you are working on. Use non-contact voltage tester to confirm there are no live circuits in the box you are working in! 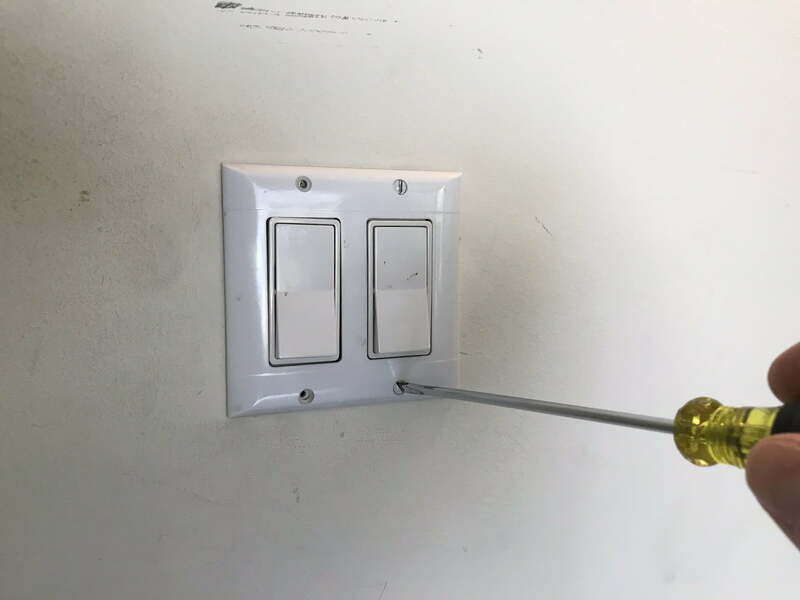 Remove existing light switch.Loosen mounting screws (top and bottom) on existing light switch. 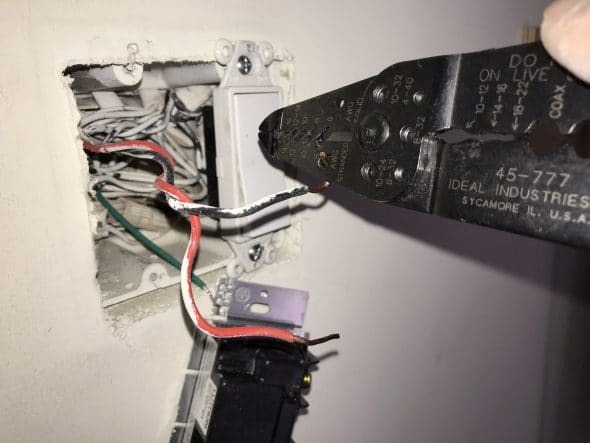 Once the screws are loose, pull the switch out of electrical box, exposing its connections. 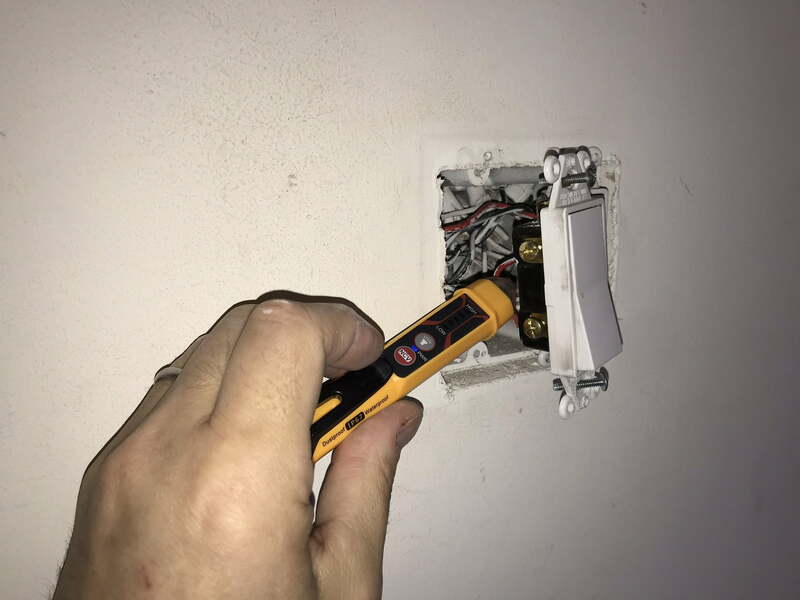 To remove push-in quick connection wires, use a small standard screwdriver to push in locking tab next to wire hole and pull wire out. Once the switch is pulled out and the connected wires are exposed. You will notice a wire connected to each of the two side terminal screws of the old switch. 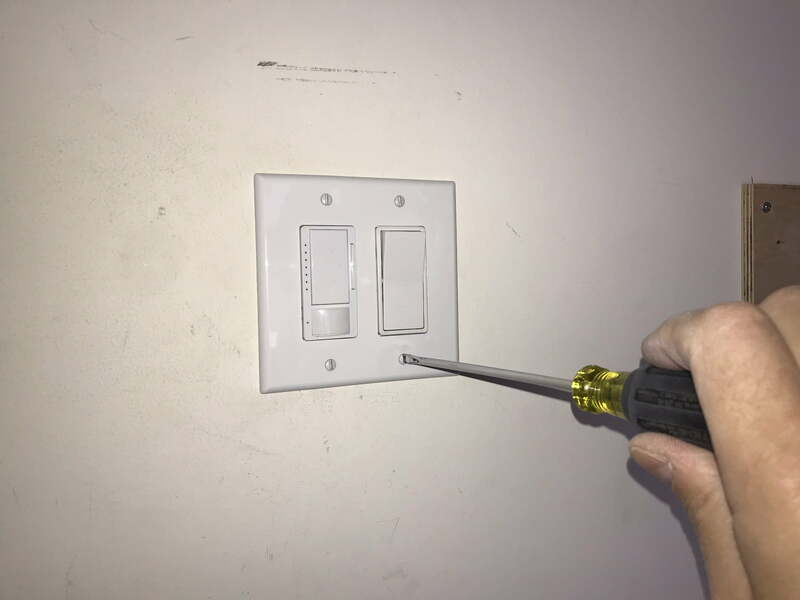 If the wires are connected to the screw terminals, use a screwdriver to remove by turning counter clockwise. 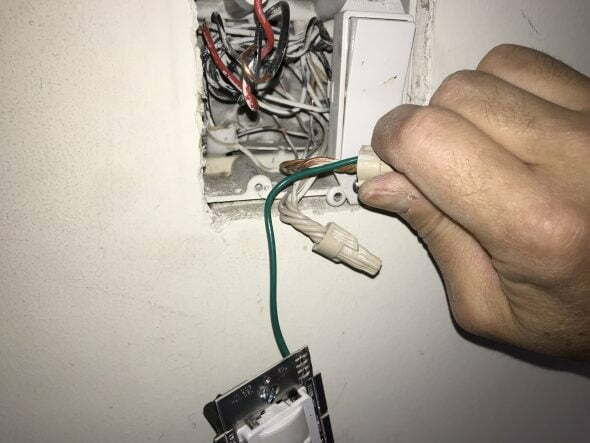 However, if wires go directly into small holes in the back of the switch, the wires are connect via a “quick-connect” mechanism. The quick-connections can be released by inserting a small standard screwdriver into the release tab near the connection hole. 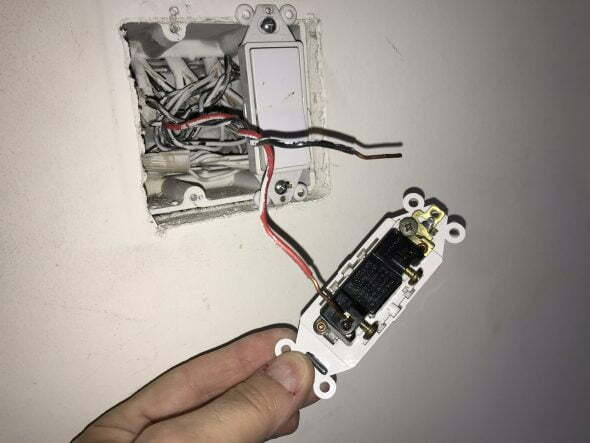 The two wires connected to the old switch are the two wires you will connect to the new motion sensor dimmer light switch. Both wires will typically be black or one black and the other red. If the light switch is for a single lighting circuit it will only have two screw terminals and a ground terminal. If the switch is a three-way switch it will have additional terminals – see the package insert for more details regarding three-way circuits. Line (black) and load (red) wires from existing light switch. One of these two wires is the “line” or hot wire (connected to the electrical service) and one is the “load” (connected to the light fixture) wire. The switch simply alternates between connection or disconnection of the electrical supply line to the light fixture load. In addition to the two black wires (the line and the load), there may also be a green or plain copper ground wire connected to the switch – if so disconnect this wire to. Connect the new motion sensor dimmer light switch to the existing wires.Using the same two black wires that you removed from the old switch, connect the new dimmer motion sensor light switch. Prepare the wires to be re-connected to the new switch by straightening, re-stripping and looping wire as needed. 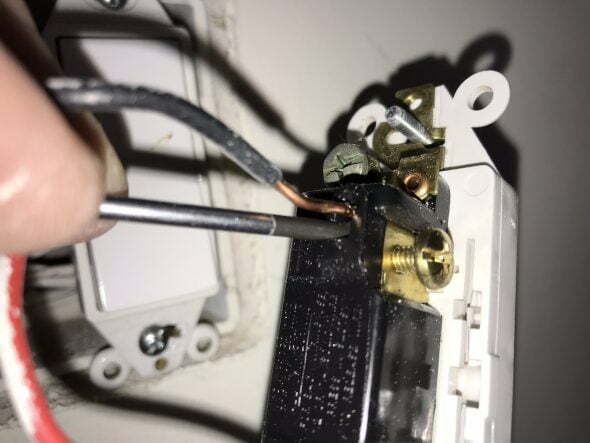 If using the quick-connect terminals at the back of the switch, you will need a straight, stripped end of the wire of proper length. The is typically a wire length guide molded into the back of the switch body. I recommend not using the quick-connections and securing the wires to the switch using the screw terminals. 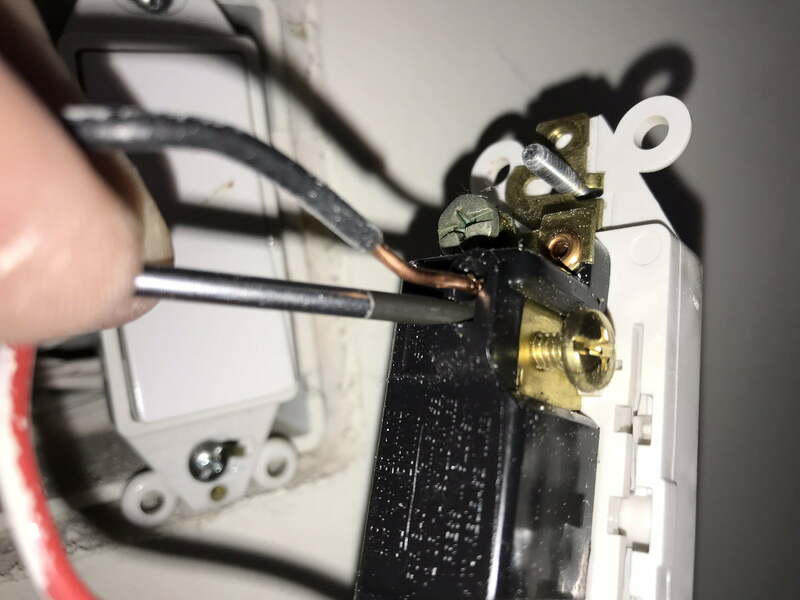 To prep the wire for connection to the screw terminals, you will need a bare copper hook or loop at the end of the wire. The loop can be made with needle nose pliers or using the loop holes at the sides of most wire strippers. Loop wire ends to prepare for connection to switch screw terminals. 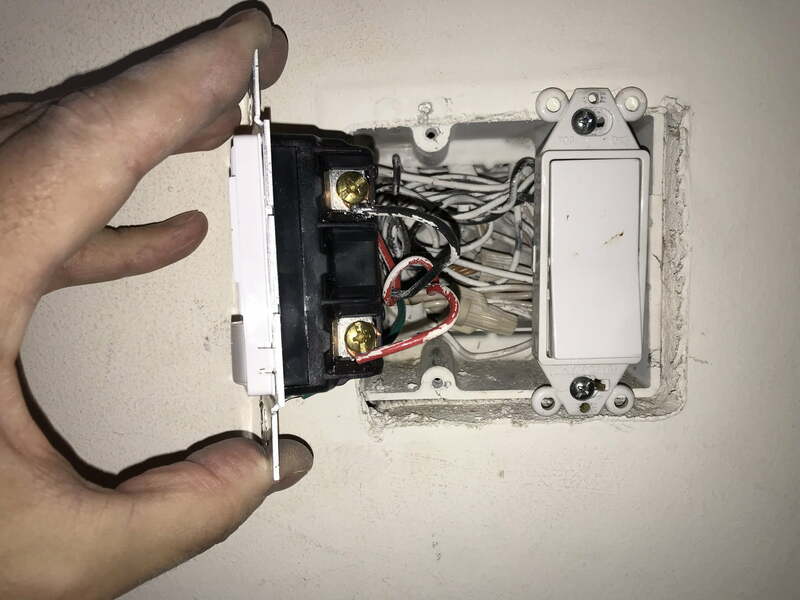 Attach new motion sensor light switch to load, line and ground connections.Connect the supplied green ground wire from the new switch to the ground wires within the box. To connect, loosen the wire nut holding the ground wires together – the ground wires are typically the bare copper wires. Just for reference, typically; the black wires are the “hot” line wires, the white wires are the “neutral” wires and the bare copper or green wires are the ground wires. Find the ground wires and remove the wire nut (twist on cap for wires). Then, wrap the green switch ground wire with the ground wire group and reattach the wire nut. Turn the wire nut multiple times until it tightens the wire group and begins to twist all the group wires together. Make several more turns until the wire group takes a uniform twisted grouping (see white (neutral wire grouping before as an example). The wire grouping should now be secure. Check to see the switch ground wire is secure under the wire nut. Connect the green ground wire from the new switch to the existing ground wires. Next, connect the black wires (black and red in my case). Hook the bare wire loop of the black wire around the brass screw terminal. Hook the bare wire loop of the red wire around the black screw terminal. Either of the wires can be connected to either of the black or brass screws when there is only one lighting circuit (like this connection). If there is a third (typically blue) screw terminal, tighten it flat – it will not be used. 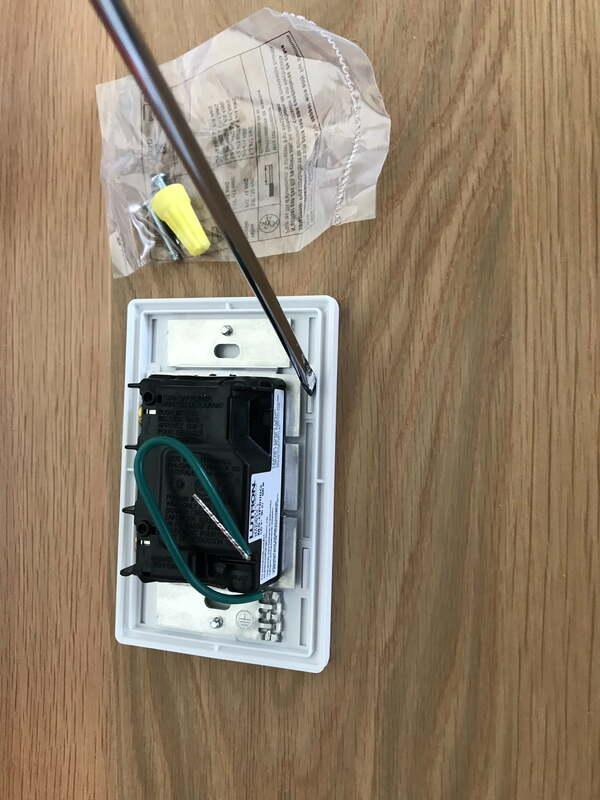 Connect line and load wires to motion sensor switch and tighten with standard screwdriver. Wire loop should be clockwise so it tends to tighten with screw terminal tightening. 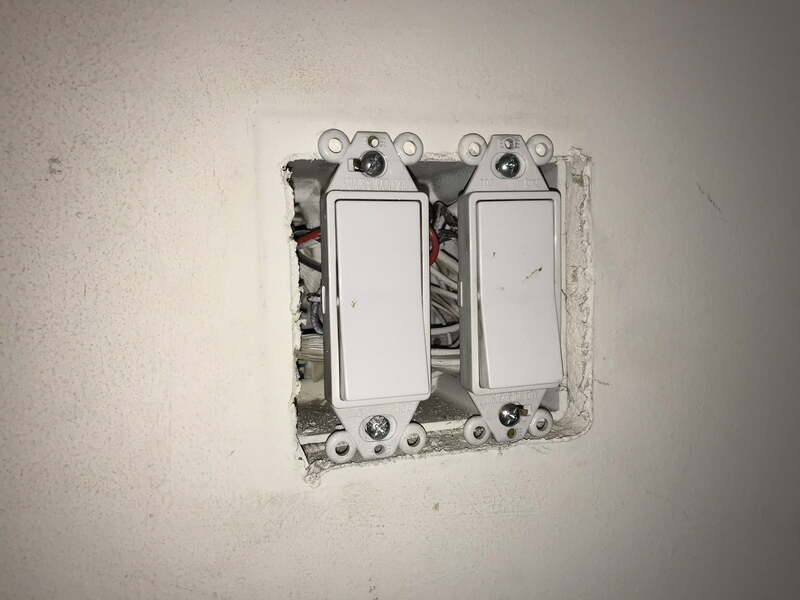 Mount Switch in Electrical Box.If you are installing more than one switch or installing it next to another dimmer switch, you may need to remove the aluminum cooling wings at the side of the switch. If you do remove one or both sides of the cooling wings, you will need refer to the “de-rating” chart in the switch package insert to check on the power handling capacity of the modified switch, as removing the cooling fins decreases the ability of the switch to cool and in turn, limits it’s power handling capacity. Cooling fins can be removed to make room for multiple switches / dimmers. See package insert to check power handling of modified switch. Once all wire connections are tight, tuck the extra wire into the electrical wall box and mount the switch by tightening the screws at the top and bottom of the switch. These two screws thread into the two small holes a the top and bottom of the electrical wall box. 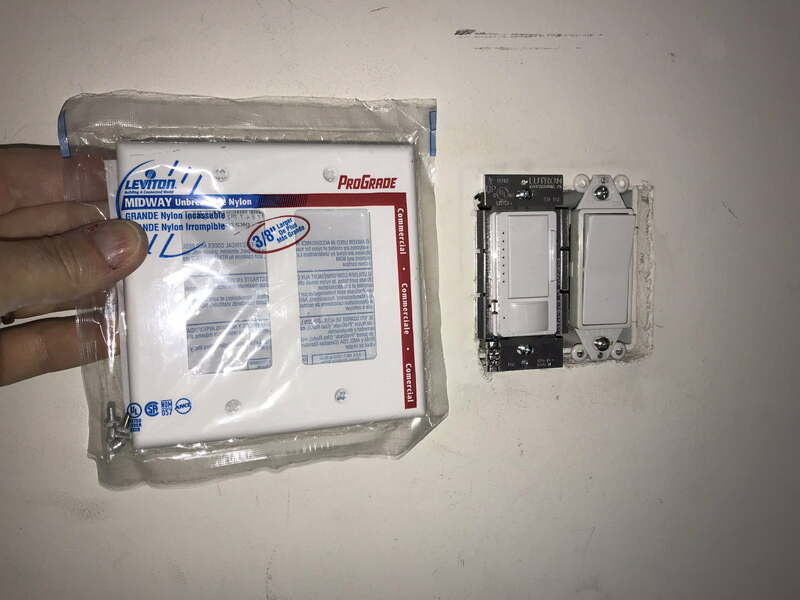 Install Switch Plate cover and Test SwitchAfter the switch is mounted within the wall box, install the wall plate cover. 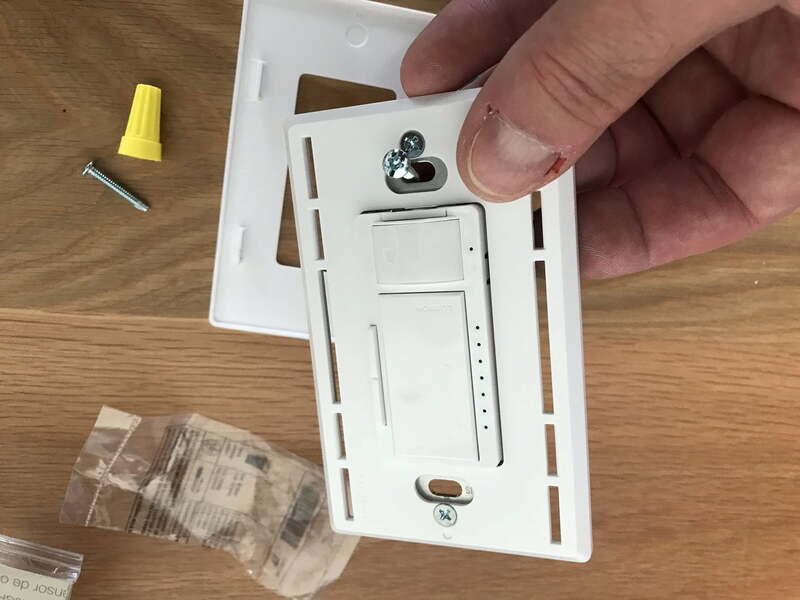 The wall plate installs with screws above and below each switch or it you are using a Decora screwless cover, a base plate is attached by screws and the top plate snaps onto the base plate. Line up screws with screw holes and screw in switch plate. Once the switch cover is installed, turn the power back on. The switch should now be working. 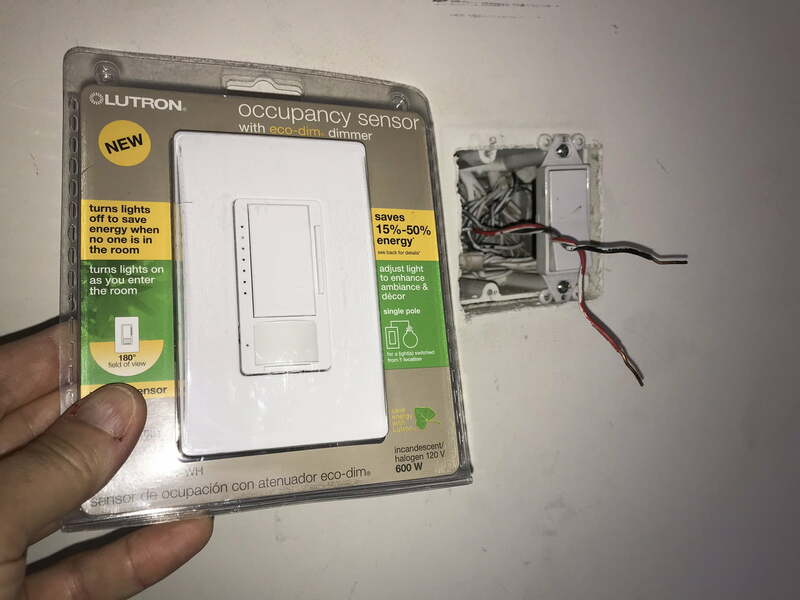 If you are using the same Lutron dimmer motion sensor switch as I did, you will notice the green LED illuminated to the left of the switch. The motion sensor LED will also illuminate when motion is detected. You should be able to turn the light on and off by pushing the switch button. Double click to turn off. The light intensity can be set using the rocker on the right of the switch. The brightness level will be recalled with motion activation of the switch. See the package insert of the product you are using for feature adjustment options. Enjoy your motion sensor lighting! Smart light switch - motion sensor light switch install. To remove push-in quick connection wires, use a small standard screwdriver to push in locking tab next to wire hole. Connect line and load wires to motion sensor switch and tighten with standard screwdriver.